More than a decade ago, because of the phenomenal growth in the power of computer simulations, The University of Georgia formed the first institutional unit devoted to the use of simulations in research and teaching: The Center for Simulational Physics. As the simulations community expanded further, we sensed a need for a meeting place for both experienced simulators and neophytes to discuss new techniques and recent results in an environment which promoted extended discussion. As a consequence, the Center for Simulational Physics established an annual workshop on Recent Developments in Computer Simulation Studies in Condensed Matter Physics. This year's workshop was the eleventh in this series, and the interest shown by the scientific community demonstrates quite clearly the useful purpose which the series has served. The latest workshop was held at The University of Georgia, February 23-27, 1998, and these proceedings provide a "status report" on a number of important topics. This volume is published with the goal of timely dissemination of the material to a wider audience. We wish to offer a special thanks to IBM Corporation for their generous support of this year's workshop. 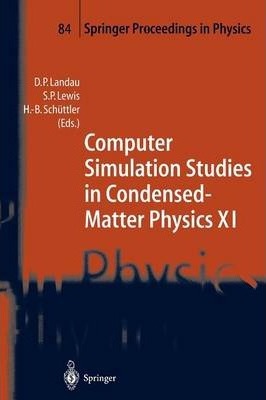 This volume contains both invited papers and contributed presentations on problems in both classical and quantum condensed matter physics. We hope that each reader will benefit from specialized results as well as profit from exposure to new algorithms, methods of analysis, and conceptual developments. Athens, GA, U. S. A. D. P. Landau April 1998 H-B. Illustrations note IX, 227 p.
Computer Simulation Studies in Condensed Matter Physics: An Introduction.- I Disorder and Frustrated Systems.- Equilibrium and Off-Equilibrium Simulations of Chiral-Glass Order in Three-Dimensional Heisenberg Spin Glasses (With 8 Figures).- Ising Spins on 3D Random Lattices (With 2 Figures).- Magnetic Properties of the Highly Diluted Al-Fe Disordered System (With 3 Figures).- Monte Carlo Simulations of Frustrated Classical Spin Systems (With 2 Figures).- Overlap Barrier Calculations for Spin Glasses (With 2 Figures).- MC Study of the p-state Mean-Field Potts Glass (With 2 Figures).- The Random Transverse Field Ising Ferromagnet: The Simplest Disordered Model with a Quantum Phase Transition (With 6 Figures).- Quantum Monte Carlo Study of Random Antiferromagnetic Heisenberg Chain (With 2 Figures).- Recent Results from Protein-Folding Simulations in Generalized Ensembles (With 4 Figures).- II Numerical Approaches to Quantum Systems.- From Finite Temperature Many-Body Perturbation Theory to Series Expansions and Monte Carlo Simulations (With 7 Figures) 71.- Stochastic Diagonalization (With 4 Figures).- Zero-Temperature Phase Transitions in Molecular Solids by Diffusion Monte Carlo(With 3 Figures).- III Thin Film Growth.- Chemical Diffusion, Wave Propagation, and Equistability in Lattice-Gas Models for Bistable Surface Reactions (With 4 Figures).- Numerical Surprises in the Kardar-Parisi-Zhang Equation.- IV Phase Transitions and Critical Phenomena.- Ising Relaxation Dynamics: Series Expansion and Monte Carlo Simulation (With 2 Figures).- Non-equilibrium Relaxation Study of Critical Phenomena (With 2 Figures).- Hard Simulation Problems in the Modeling of Magnetic Materials: Parallelization and Langevin Micromagnetics (With 2 Figures).- Zeros of the Grand Partition Function of the Potts Model in a Magnetic Field (With 3 Figures).- Modeling FM/AFM/FM Trilayers with the 8-state Clock Model (With 3 Figures).- Monte Carlo Study of Oxygen Ordering in YBa2Cu306+x(With 4 Figures).- Boundary Conditions and Numbers of Clusters in Percolation Models (With 2 Figures).- Magnetic Properties of Finite 3D Ising Systems: a Microcanonical Approach (With 1 Figure).- V Methods.- Broad Histogram.- Invaded Cluster Algorithms for Equilibrium Critical Points (With 3 Figures).- Combinatorial Optimization: Old Results with New Ensembles, New Results with Old Ensembles (With 4 Figures).- Visualization for Molecular Dynamics of Solids.- How to Use Multiple CPUs on a Node with Little Effort (With 1 Figure).- VI Polymers and Glasses.- Atomistic Molecular Dynamics Simulations of the Static and Dynamic Properties of a Polyethylene Melt (With 8 Figures).- Spatially-Correlated Dynamics in Glass-Forming Systems: Correlation Functions and Simulations (With 4 Figures).- List of Contributors. David P. Landau is the Distinguished Professor of Physics and Director of the Center for Simulational Physics at the University of Georgia.